AD PATRES is a French Death Metal band who formed in 2008. 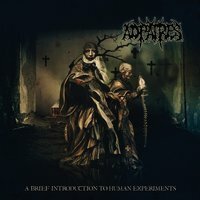 “A Brief Introduction To Human Experiments” is their second full length, also having released a demo and a split with WRITHING. After the brief intro track, I immediately took notice of the impeccable balance these five guys write and play with; their sound is a perfect combination of Technical Death and Brutal Death without going too far into each sub genre. Their musicianship blew me away but it didn’t overstay its welcome—this album doesn’t have any guitar masturbation, endless solos, or overly complicated passages for the hell of it. Despite how crushing the album is, it isn’t heavy for the sake of being heavy either—this allows for Death Metal that isn’t confounded by its own problems or trapped so far into its own genre that it can’t get out. Instead, we get an album and band that is so laser focused on its goals that the reward for the listener is a tight package of unrelentingly balls to the wall Death Metal. The album’s MVP is without a doubt vocalist Axel Doussaud. His gutturals are like a monster bursting out from the walls of Hell but his enunciating and inflection in them are perfect. Even if the rest of the band sucked, this album would still be worth attention based on his performance alone. “Mechanical Enlightenment,” is the first full length track and it fires right out of the gate, smashing it to pieces. The guitars immediately grasp the balance I spoke of earlier: guitarists Oliver Bousquet and Py Marani have more than enough talent and intensity to take these songs into technical, or even prog, territory…and also into some truly brutal styles. However, their refined, and mature, control keeps the Death Metal riffs tuned to a nice, crisp intense show that doesn’t go out of its way to be more than it should because it provides exactly what is needed. Bassist Arnaud Pecoste is the perfect foundation for the band—he makes the songs even heavier and adds an extra extreme layer to the album’s sound. “Led By Flesh,” shows how truly intense the band can be. The track clocks in under three minutes but there isn’t a second that isn’t devoted to crushing skulls. Alsvid's drumming is lighting quick, the audio equivalent of blinking your eyes as fast you can, for as long as you can. The middle part of the song had to be purposely written to cause your neck to fall off from too much head banging, there is no other explanation on how it can be so unforgiving. The album even contains some groove, as evident within the opening moments of “Spellbound,” and the riffs after the guitar solo. This is easily one of my favorite tracks on the album; it is just such a fun track, an aspect that is hard to pull off in this genre. The final track, “The Floating Point,” takes a bit of a different approach than the others. It is almost seven minutes in length and it has a decent sized intro that builds up until the sound explodes at 1:32. This is also one of the better tracks to me and this longer structure is something I would enjoy to hear the band exploring more in future releases. However, despite the size and the many different parts to the song, the band still follows its path without straying too far and getting boring. One aspect of the album does, at least somewhat, not sit with me: it is a bit on the short side. Don’t get me wrong, 34 minutes is plenty of time to destroy the senses but I can’t help but shake the feeling it needed one more song or two, especially when you consider two of them are just short instrumentals. Still, it is quality, not quantity, that matters and this album has that in spades. Quibbles aside, the album is a constant barn burner. Despite how early we still find ourselves in 2019, this album has raised the bar high for Death Metal. At the very least, other DM bands this year better bring their “A” game if they have a hope of competing with this album.